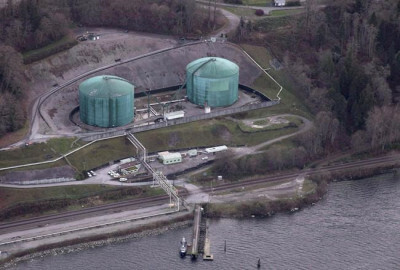 CALGARY — Kinder Morgan Canada and Burnaby, B.C., clashed in a National Energy Board's hearing room Monday over the fate of local permitting for the controversial Trans Mountain expansion project. The company (TSX:KML) argued at the NEB's Calgary headquarters that local political opposition to the $7.4-billion pipeline project has tainted permitting in the city and the process is now delayed, requiring the NEB to step in and override local bylaws to maintain the federal government's wishes that the project go ahead. "When unreasonable delay, which based on the evidence, could continue into perpetuity, (it) must be seen as an outright refusal and unconstitutional," said Trans Mountain lawyer Maureen Killoran. The company has been frustrated at the lack of firm timelines, guidance and structure in the local process as it tries to secure permits for actions like tree removal and fence installation ahead of construction of oil storage and loading facilities in the city, she said. Killoran said strong and vocal opposition by Burnaby Mayor Derek Corrigan to the project has created an atmosphere of opposition, even if the mayor has not specifically interfered in the process. "He doesn't have to. He's in the newspaper, regularly, this is their leader. He's in the newspaper, on the radio, he's everywhere. He's on the radio saying who's going to stand with me and stop the bulldozers?" "It has poisoned the well within the city of Burnaby. We are not going to get an efficient process there," said Killoran. Burnaby, however, said there's been no unreasonable or illegitimate delay, no intention from city officials to do so, and that it is the company that is to blame for the slow pace of permitting. "It is our position that the time for permit processing here has been primarily driven by the incompetence, or the ineptness perhaps, or at least the inexperience, of the consultants for Trans Mountain in complying with basic municipal approval processes," said Gregory McDade, Burnaby's lawyer. "Trans Mountain has failed to put in a minimally viable application that almost any experienced developer in the city of Burnaby or other major cities would have known to put in." McDade said it's up to Trans Mountain to prove there has been an unreasonable delay or intention to delay, and that it hasn't done so. In legal filings, Burnaby also said that Trans Mountain didn't apply for its Burnaby permits until June, with no explanation as to why they waited so long after receiving federal approval in November, 2016. Michael Davies, Kinder Morgan Canada's vice president of operations, said in an affidavit that it could cost the company between $30 million to $35 million in salaries, corporate support and other expenses for each month of delay in the project, while the company stands to lose more than $90 million in revenue for every month the start-up is delayed.